Everyone likes to shop on holiday and the shops in Valletta have plenty of tempting goods on sale. 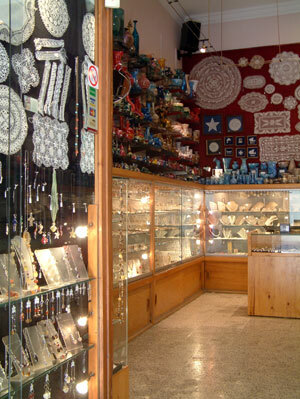 You will see typically Maltese handicrafts such as lace, delicate silver filigree and stunning art glass. These are not cheap and reflect the time and expertise taken to make each one by hand. This is the type of gift that becames a family heirloom. Almost all shops accept credit card payments and there are plenty of ATMs to withdraw Euros using bank cards. As you walk through the centre of town and around the main bus station you will also come across cheap souvenir traders. The types of shops are very similar to those in Britain with newsagents, clothing retailers (many British and International names), jewellers, bakeries, florists and fascinating old-fashioned ironmongers selling baking tins of all shapes and sizes and everything you might need for the house. If it's bargains you're after and don't care about brand names, a flea market is held every Sunday by the bus terminal near the city gate.